You have probably seen those colored strips of tape that are often applied during athletic competition and training and thought “What is that?” Perhaps you have even used kinesio tape and wondered what kind of magic lessened the pain while you continued to train. It is a treatment that can travel with you to go to a race, but how does it work? Most people are familiar with athletic taping, but kinesiotaping is something different. Kinesio tape’s unique design allows it to stretch up to 60% of its resting length (a 10-inch strip of kinesio tape can stretch up to 16 inches long). The standard tapes used in athletic taping and McConnell® Taping are intended to have no elasticity. While athletic taping needs pre-wrap and often requires re-taping during a sport because the tape loosens with movement, Kinesio tape (KT) is applied directly to the skin and does not loosen or restrict movement. KT is water resistant and breathes while providing results for several days per application. KT has a special type of acrylic adhesive bonded to the latex-free fabric on one side but the tape itself does not have any embedded chemicals or drugs. The tape is hypoallergenic, however long-term use of kinesiotape is not advised because prolonged use can cause some people to develop a sensitivity to the tape. Those who commonly react to medical bandages would not be advised to use KT. The original method of taping is known as the Kinesio Taping Method and the tape that was introduced to the medical market as Kinesio Tex Tape, which was originally only available to healthcare providers. The tape gained popularity due to its high visibility at the Olympic Games in Beijing leading to multiple competitors entering the market and selling directly to consumers, including KT Tape, RockTape and others. Most of these copycat tapes sold directly to consumers are poorer quality and cause people to react more often than the kinesio tape that I use in my office. The Kinesio Taping Method is a therapeutic system of taping used to treat a variety of clinical conditions, including neuromusculosketal disorders. The tape can be applied using different approaches to improve circulation, lymphatic flow, muscle function, joint balance and the function of fascial tissue. The tape can be applied in hundreds of different ways depending on the desired effect. Studies have shown that KT is effective at temporarily relieving pain and increasing range of motion. When kinesio tape is applied using the Kinesio Taping Method, it microscopically lifts the skin. This lifting of the skin forms convolutions or wrinkles in the tape and skin that you can see when it is applied in certain techniques. The convolutions of tape increase the interstitial space (space between the skin and underlying muscle) and cause the “lifting effect”. This lifting allows for a decrease in inflammation and reduction in pressure in the target area while increasing the flow of lymphatic fluid out of the target area. Large, painful bruises can quickly be drained with proper application of kinesio tape using lymphatic drainage techniques. Kinesio tape reduces pain by stimulating pressure receptors within the skin. By laying the tape over top of the skin, it gives reinforced feedback to the brain and the somatosensory system. It allows our brain to shut down extraneous information, much like how you don’t notice the feeling of your wedding ring on your finger or the watch you wear every day. In the same way, your brain should suppress the pain when the brain is working appropriately and the pain is not too severe. Runners can sometimes just run through the pain because of the same mechanism in the brain. Your brain gets feedback from your muscles, ligaments and your skin when you bend a joint. The stretching of the skin is one of the things that lets you know where your body is in space. Having tape on the skin augments the sensation and increases the ability of the brain to process the pain and shut down the continuous reminders of pain. Kinesiotaping is not designed to fix the root cause of the pain, nor does it usually eliminate pain. It is meant to reduce pain and help functionality while the root cause is addressed using other treatments. There are hundreds of different ways that KT can be applied but a proper evaluation must be done to ensure that it is appropriate for the person to be taped. A proper evaluation would include testing muscle strength, reflexes and mobility along with performing orthopedic exams and evaluating gait. For certain conditions, kinesio tape should not be applied. Self-application after watching a YouTube video can be just as problematic as diagnosing yourself after a Google search. I have found that DIYers will apply things incorrectly and cause themselves blisters, or they just do it wrong and exacerbate the problem. Runners often fear they will be told to stop training or drop out of the race. However, a trained healthcare provider can utilize kinesiotape to help you stay in the race while addressing the underlying issue. Because kinesio taping is a passive treatment and does not actually fix the problem in the majority of cases, continued reliance on KT will help build the dependency and make it more difficult to recover. I discourage self-taping because I encourage full recovery, not just reliance on the kinesio tape as a crutch. In my office, we are treating the patient using techniques to reduce the pain while loading and strengthening the areas involved. Once there doesn’t seem to be much of a difference between having the tape and not having the tape, patients should discontinue use. What Conditions Can Benefit from Kinesio Taping? 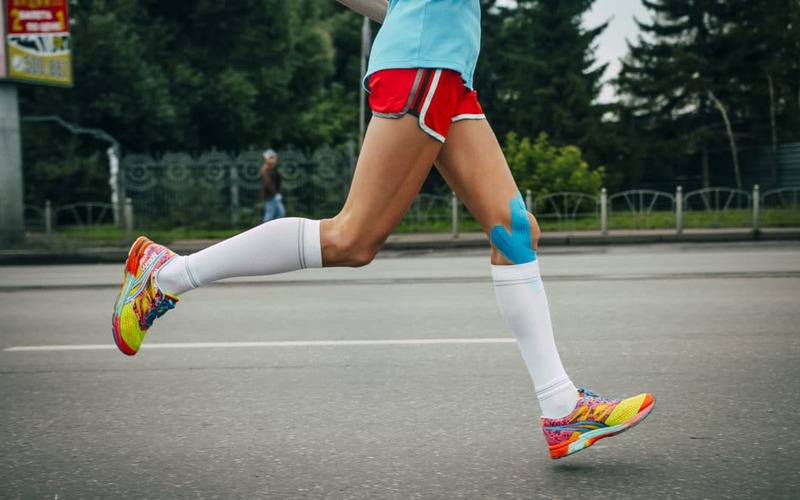 Kinesiotaping can help several conditions that are concerning for runners. It helps reduce pain in the knee from issues like patellar tendinitis, patellofemoral tracking syndrome and iliotibial band syndrome as well as problems in the ankle and foot, including plantar fasciitis and Achilles tendinitis. It can be particularly effective when applied to sprained joints or strained muscles. Utilizing kinesiotape, while also receiving concurrent treatment to the soft tissue with Graston Technique or the involved joints with chiropractic adjustments to the foot, ankle, knee, hip and/or spine, is the most effective way of fixing problems while allowing runners to continue to race and train. For more information on kinesio tape, including pictures of it applied to athletes and how it heals bruises, take a look at my website at https://besttoledochiropractor.com/kinesio-taping/.